the lives of 11 FHWA family members. April 19, 1995. It should have been an ordinary day. 9:02 a.m. Our country and our lives changed forever. The Federal Highway Administration family remembers our loved ones and their families. Most especially, we honor those whose strength and commitment were undeterred in their continued service to the American People. April 19th marks the anniversary of a painful moment in our history. On that date in 1995, we lost 11 valued employees. Please take a moment for silent reflection on April 19th at 9:02 a.m., Central Daylight Time, to think of those we lost, those who survived, and those who continue to serve our partners and customers in Oklahoma. Also, please keep their families and other loved ones in your thoughts and prayers. The fund was established specifically for the FHWA and FMCSA employees and their families. There is an advisory board consisting of the DOT, FHWA, and FMCSA employees that prioritizes and directs financial assistance to the areas of greatest need. Funds sent to FEEA are used to help pay the college costs of the FHWA and FMCSA children who lost a parent in the bombing. Thank you for continuing to remember and honor those individuals who were lost and the strength and perseverance of those they left behind. We will always remember. The Oklahoma redbud grove is located at the FHWA Turner-Fairbank Highway Research Center in McLean, Virginia. 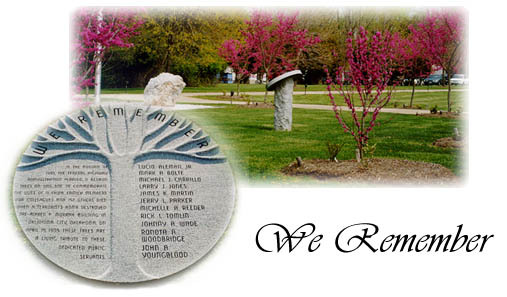 To learn more about the memorial tree grove, read "A Living Memorial", Public Roads On-Line, Winter 1996.